Before we head to the outback we have stopped down by the seaside at Brighton Caravan Park near Adelaide and it's perfect time for a little tipple. Yes it's 'happy hour' the sea is calm, the sun is setting and my wave has come in! A few months ago Paul bought a Batavus Moped over the internet and had to collect it here in Adelaide. It is has 50cc engine and you can pedal it like a pushbike. It's perfect for the back of the camper. Paul would like to know if you need to register these bikes in Europe or if you need a licence to ride them. I wonder if anyone can help please? Your Tipple wave is very beautiful. Love the wave! Oh, how I envy your travels (in a really good way, of course). Have absolute fun! A wonderful tiplle wave. 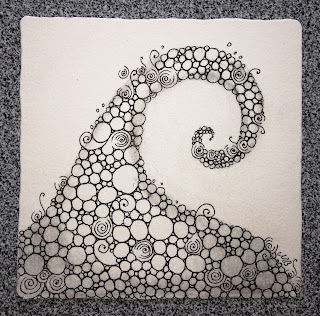 Love the way you put in som spirals in the tipple circles, makes the tangle more exciting. Well done. Your usual delicate, beautiful work. Gorgeous! Fun! I love the beach. Great idea to tangle a wave. Hope you had a wonderful trip. Great Tipple, Printemps makes it more alive ! About the mopet, In the Netherlands you need to register and also you need a licence for driving it. I don't know if it's the same in the rest of Europe. Have a fantastic trip to the outback!!! Thanks Mariët, Paul thought it might have had a number plate. Great combination for your wave. Lovely. Love your Tipple wave and the Printemps add a lot of excitement to it! Brilliant tile! Wonderful wave with a great combination of Tipple with Printemps! Enjoy your trip. I am always amazed by your unique and creative ways to address the challenges. Was not disappointed by this one. Is simple yet amazing. Love your wave of Tipple! Awesome! Shelly, you always find your own way to respond to the challenge. This is delightful. What a magical little Tipple you have there, it has attitude. Eyecatching, your tipple wave is lovely!! Your strokes are so neat, they enhance the beauty many fold. Very beautiful. lovely , your tile with Tipple, a nice wave! Wooooah.....!! Gorgeous and the printemps adds dimension and interest to your wave. Love!! So, it's a wave? I thought it was a kiss...either way, that's so simple and soooo pretty! Oh what a lovely wave..like in a poem, waving a happy holiday!! Your work blows me away every week! This one is no exception. Its great!